Today, NASA’s Hubble Space Telescope is known for capturing incredible images of the cosmos, but 20 years ago, the project was struggling to validate its own existence. One astonishing photo changed that—and our view of the early universe—as Vox explains in a new video (below). The vessel launched in early 1990 and had a big issue immediately: a flaw in the 94.5-inch primary mirror, which meant that Hubble was taking blurry photos. It would take until 1993 before the issue was fixed, but once the telescope was in tip-top shape, Space Telescope Science Institute director Robert Williams started thinking big. While Hubble was generally used for documenting specific targets in space, Williams wanted to see whether there was any value in taking a broader snapshot. The resulting image of a small "keyhole" portion of the sky above the Big Dipper became an icon. Over the course of 10 days in December 1995, Hubble took 342 frames at four different wavelengths of light—light that had been traveling for billions of years, showing at least 1500 galaxies as they were near the beginning of the universe, and in various stages of evolution. 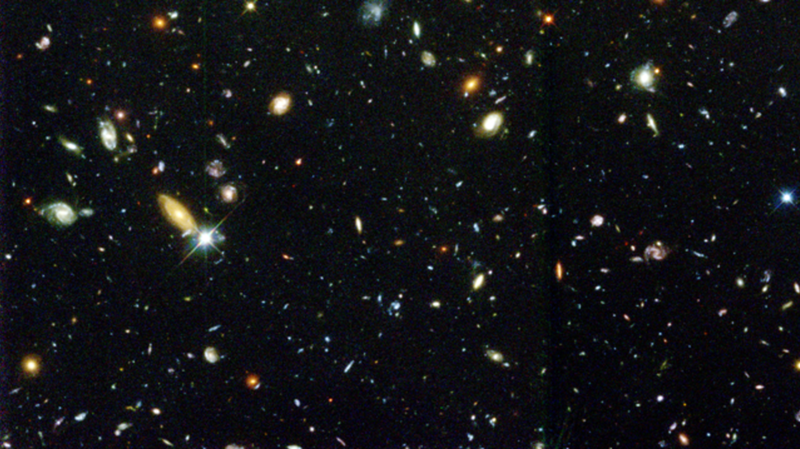 The Hubble Deep Field photo proved that the telescope was capable of seeing far more than previously believed, helped to solidify public interest in the project, provided valuable information for researchers, and changed the culture around releasing data to both the wider scientific community and the public, as Vox explains. The landmark image is now more than 20 years old. Check out the video from Vox for an even deeper dive into the Hubble Deep Field.